„Rippin’ It In Cincinnati“. It was the1st tour of 1976 and some of Elvis’ key musicians were replaced. Unexpectedly, the result was a surprisingly fresh sound, with keyboards and drums prominent. During this rather short tour, Elvis performed 8 solid and entertaining shows in 4 cities. 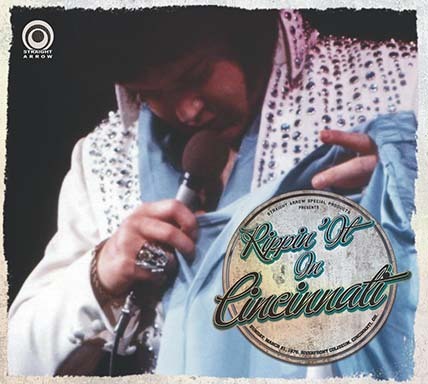 The Cincinnati, March 21st, 1976, 2:30pm show is previously unreleased. Once again, this show was not available in acceptable sound thus far. The only existing tape in circulation was in subpar quality. This was the show where Elvis ripped the seat of his blue Bicentennial suit during “Polk Salad Annie”, and finished the show dressed in the Rainfall suit. It is one of the very few shows where Elvis left the stage for awhile (another example is Baltimore, May 29, 1977, released on our 2CD “Breakdown In Baltimore”). Our release has been taken directly from a first generation copy of a previously unreleased original audience-recorded cassette. This concert was recorded by Elvis super fan John Herman, who also taped the legendary Pittsburgh 1976 New Years Eve show, widely released by bootleggers and by the official FTD label. 01. Introduction: Also Sprach Zarathustra - 02. C. C. Rider - 03. I Got A Woman / Amen - 04. Love Me - 05. Let Me Be There - 06. You Gave Me A Mountain - 07. Steamroller Blues - 08. All Shook Up - 09. (Let Me Be Your) Teddy Bear / Don't Be Cruel - 10. Love Me Tender - 11. Polk Salad Annie / Elvis leaves the stage to change the jumpsuit - 12. Introductions of singers, musicians, orchestra (by J. D. Sumner) - 13. What'd I Say (James Burton, instrumental) - 14. Drum Solo (Larry Londin) - 15. Bass Solo (Jerry Scheff) / Elvis returns - 16. Piano Solo (Shane Keister) - 17. Electric Piano & Clavinet Solo (David Briggs) - 18. School Day - 19. And I Love You So - 20. Hurt (with reprise) - 21. Burning Love - 22. America The Beautiful - 23. Funny How Time Slips Away - 24. Heartbreak Hotel - 25. Hound Dog - 26. Can't Help Falling In Love - 27. Closing Vamp / Announcements.